Comvita`s Pure Manuka Honey Lozenges provides the soothing qualities of pure UMF 10+. Comvita Lozenges may help support and maintain a healthy mouth, throat and immune system. Comvita Manuka Honey is sourced from New Zealand`s remote, pollution free native forests and is world renowned for its unique flavour. 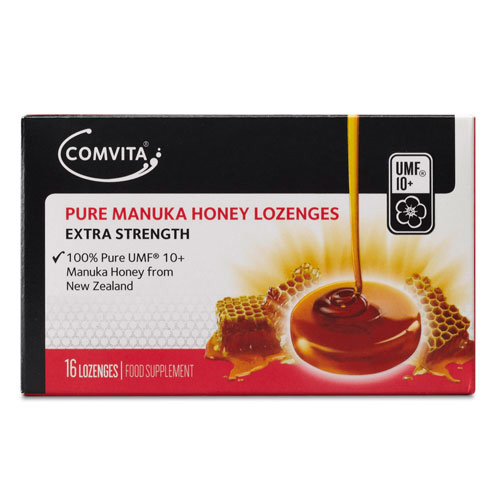 Comvita Manuka Honeys are tested for the unique antibacterial properties which make New Zealand Manuka honey famous. Pure New Zealand Pure Lozenges UMF 10+. Dissolve 1 lozenge slowly in the mouth. Repeat as required up to 5 times a day. Do not give to children under the age of 2 years of age without medical advice. Below are reviews of Comvita Pure Manuka Honey - Extra Strength - 16 Lozenges by bodykind customers. If you have tried this product we'd love to hear what you think so please leave a review.